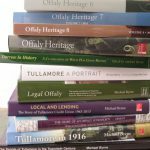 Offaly History now has a public catalogue of 10,000 of the books in our library on LibraryThing.com. This catalogue will be updated frequently. The extensive list is categorized and search able.